Recently I bought a whole mess of plant labels from the wonderfully named Paw Paw Everlast Label Company. We spent the weekend puttering in the garden, cleaning, planting, moving, mowing. Miss M. spent a good part of the morning arranging my "signs". 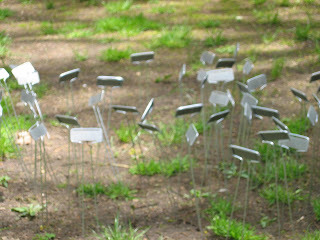 The photo is lousy, but the forest of plant markers was a thing of great beauty. Incidentally, the plant markers are great. The price was great, and they arrived amazingly fast. The markers will make your garden look so professional! I love the installation - it always amused me how my son loved to categorize and group things, trying to put order into his world.